Comments/Context: Letha Wilson’s most recent gallery show consists of only four pieces, but that doesn’t mean it’s light on new ideas. Her exploration of the intersection of photography and sculpture continues to gather momentum, and even in this small single room exhibit, she’s displaying fresh innovation that reaches in multiple directions. If Wilson’s art has developed a signature look, it is to be found in her interlocked combinations of photographic imagery and poured concrete, where color photographs of landscape forms are actively swirled together with the grey industrial material, creating hybrid works that intermingle natural and manmade and jut into the room with a muscular physicality. Wilson’s newest iterations along this line of thinking have introduced a recently perfected manufacturing step, where imagery is now directly applied to portions of the concrete via an emulsion transfer process. This has created a kind of in-between zone that mediates between the previously separate striations of photography and concrete, and adds subtle new colors and textures to the mix. Striped canyon sediments and jungle greenery now exist both in a bright form (on the white paper) and a duller form (on the grey concrete), where pinks turn mauve and greens turn olive. This process also allows her to play further with the push and pull between flatness and three dimensionality, as images float on a concrete substrate that is made smooth or squeezed into jagged edged forms underneath. The works still have the raw, rough contrasts that originally made them exciting, but they now have an added layer of tonal and textural subtlety that makes them richer and more complex. The other two works on view conceptually build on pieces from her show at Art in General last year (reviewed here), and continue her investigations of how her sculptural works interact with the particular spaces they inhabit. 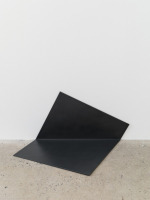 In that earlier show, Wilson offered us a rust-colored square of steel laying flat on the floor, with one corner peeled up to reveal a secret sunset image underneath; at Higher Pictures, the steel slab is now black and has been laid over the edge of the gallery floor, folding up the side wall. But it’s the title,Sunrise Down and Out, that keeps us guessing – is there a sunrise photograph underneath that just we can’t see? Similarly, at the Art in General show, Wilson threaded a wavy moonscape through one of the central white pillars of the gallery space; here, she’s turned a wispy two-sided cloudscape on its edge and let it seemingly fall through the gallery wall, poking a triangle through the sheetrock into the interior room (see the detail image above). Its obvious presence creates new geometries and angles, tilts the horizon line of the image out of synch with the gallery floor, and interrupts our walking flow through the space; it does things physically that a straightforward photograph normally doesn’t do, upending our expectations. Wilson’s recently published photobook, Between a Rock, translates many of these same kinds of spatial interventions into an elegant hand-held form. Images of rock faces, bamboo forests, mountainscapes, and palm fronds are sliced through, folded over, and interrupted by cut slits, circles, and uneven ripped holes, often rephotographed a second time to further confuse our perception. Like all of her work, the book gives her natural imagery a resolutely physical presence, forcing us to interact with the tactile qualities of the paper, seeing the photographs as both representations and objects that have been further modified. While this show doesn’t have enough new work to give us a comprehensive picture of Wilson’s trajectory, it clearly gives us a few positive indications that she is expanding and refining her experiments with composite photo-sculptural objects in innovative ways. We’ve always known that photographs could be objects, but Wilson is consciously reconsidering those definitional boundaries, and doing so without wandering into a more digital set of aesthetic concerns. It’s as if she’s reinventing landscape photography’s place within an adjacent context of old school ”real” materials and physical space, thereby changing the established rules for how we see and experience the land. Collector’s POV: The works in this show are priced as follows. The two concrete works are $23000 each, the steel piece is $10000, and the large wall puncturing image is $18000. Wilson’s works have little secondary market history at this point, so gallery retail likely remains the best option for those collectors interested in following up.